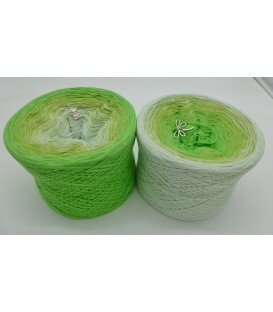 Farben der inneren Ruhe (Colors of inner peace) - 3 ply or 4 ply gradient yarn, 3 colors: pistachio, jade, opal. Fiber Content: 50% cotton 50% polyacrylic. 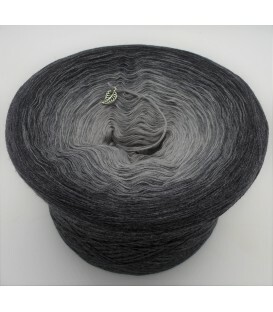 Farben der Schattenwelt (Colors of the shadow world) - 3 ply or 4 ply gradient yarn, 3 colors: mottled lead, gray mottled, anthracite mottled. Fiber Content: 50% cotton 50% polyacrylic. Farben der Seele (Colors of the soul) - 3 ply or 4 ply gradient yarn, 3 colors: jade, opal, emerald. Fiber Content: 50% cotton 50% polyacrylic. 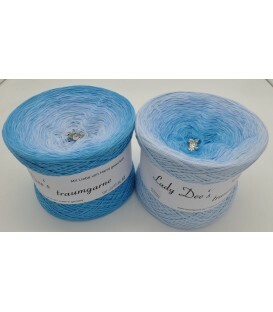 Farben der Erinnerungen (Colors of the memories) - 3 ply or 4 ply gradient yarn, 3 colors: white, nymph, riviera. Fiber Content: 50% cotton 50% polyacrylic. Farben der Karibik (Colors of the Caribbean) - 3 ply or 4 ply gradient yarn, 3 colors: jungle, petroleum, shadow. Fiber Content: 50% cotton 50% polyacrylic. 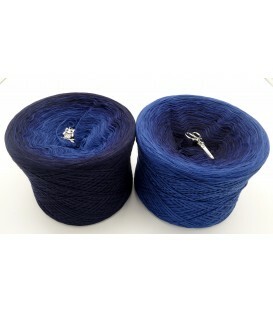 Farben der Dunkelheit (Colors of the dark) - 3 ply or 4 ply gradient yarn, 3 colors: atlantic, royal blue, shadow. Fiber Content: 50% cotton 50% polyacrylic. Farben der Elfen (Colors of the elves) - 3 ply or 4 ply gradient yarn, 3 colors: Candy, Fuchsia, raspberry. Fiber Content: 50% cotton 50% polyacrylic. 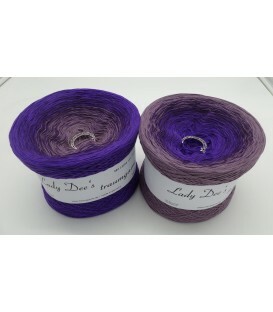 Farben der Träume (Colors of dreams) - 3 ply or 4 ply gradient yarn, 3 colors: violet, purple, tourmaline. Fiber Content: 50% cotton 50% polyacrylic. 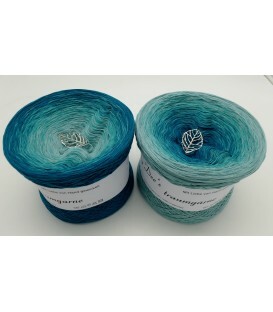 Farben des Himmels (Colors of the sky) - 3 ply or 4 ply gradient yarn, 3 colors: light blue, aqua, capri. Fiber Content: 50% cotton 50% polyacrylic. 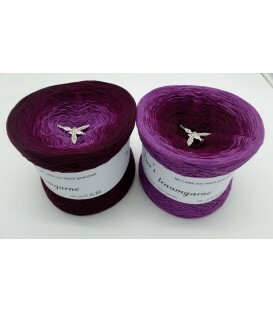 Farben des Verlangens (Colors of desire) - 3 ply or 4 ply gradient yarn, 3 colors: oleander, purple, chianti. Fiber Content: 50% cotton 50% polyacrylic. Farben des Dschungels (Colors of the jungle) - 3 ply or 4 ply gradient yarn, 3 colors: jade, opal, jungle. Fiber Content: 50% cotton 50% polyacrylic. Farben der Verführung (Colors of seduction) - 3 ply or 4 ply gradient yarn, 3 colors: mango, rust, brick. Fiber Content: 50% cotton 50% polyacrylic. 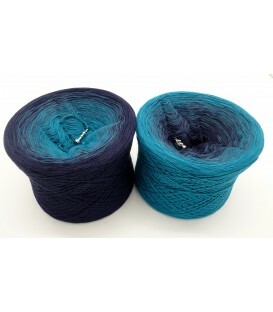 Farben der Ferne (Colors of the distance) - 3 ply or 4 ply gradient yarn, 3 colors: steel, pigeon blue, granite. Fiber Content: 50% cotton 50% polyacrylic. Farben der Natur (Colors of nature) - 3 ply or 4 ply gradient yarn, 3 colors: pea, leaf green, Apple green. Fiber Content: 50% cotton 50% polyacrylic. Farben der Blüten (Colors of the flowers) - 3 ply or 4 ply gradient yarn, 3 colors: white, lavender, heather. Fiber Content: 50% cotton 50% polyacrylic. 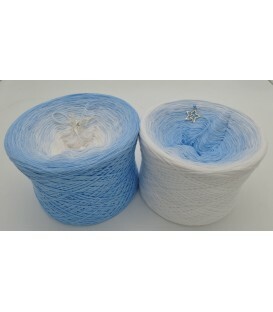 Farben des Windes (Colors of the wind) - 3 ply or 4 ply gradient yarn, 3 colors: white, light blue, aqua. Fiber Content: 50% cotton 50% polyacrylic. 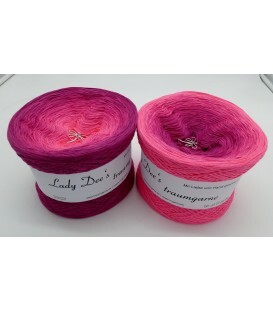 Order online Lady Dee´s Traumgarne "Color in color" gradient yarns in different lengths. 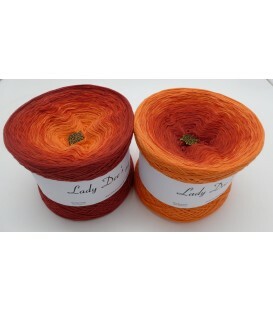 Beautiful hand-wound coloring yarns. 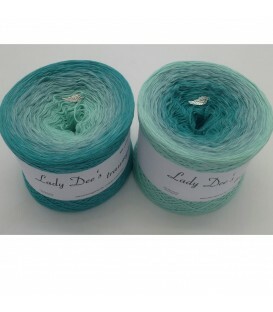 The gradient yarn is ideal for cloths, scarves, sweaters, ponchos, hats etc. The recommended needle thickness is 3 - 4 mm. You can also use any other needle size, depending on how tight or loose your project is. The Bobbels can be processed both internally and externally.